News and results from the project Weldability of nickel-base superalloys for energy applications, KME-706. The most important project results are weldability data for the relatively new superalloys Haynes282 and 718Plus. The data enables a comparison to the ‘standard’ grade Alloy718 and can provide the necessary information for material selection for hot structural parts in gas turbine engines. The application of alloys with increased maximum service temperature such as the two above-mentioned ones could be used to make the combustion process in aircraft engines more efficient. This generally affects gas turbine manufacturers as well as companies involved in the process as a supplier of either the material or manufactured parts. The tolerance towards a higher service temperature however often goes hand in hand with increased risk for cracking during welding, specifically via a mechanism called strain age cracking. This cracking phenomenon is unique for precipitation hardening superalloys and occurs during the heating towards post weld heat treatment, which is used to obtain uniform material properties after welding. Profound knowledge of the ongoing mechanisms is key to avoid failure and can be obtained via different test methods such as the one developed within this project, which provides information on the performance of microstructures close to those present in real weld heat affected zones. During the last year of the project more results will be obtained for 718Plus regarding its repair weldability, supplementing the already available data on the alloy’s weldability. Furthermore, a newly developed testing procedure using the Gleeble thermomechanical simulator will be used to characterize the resistance of Haynes 282 towards strain age cracking and to obtain a deeper knowledge on the ongoing mechanisms, which adds to the already obtained results that show the actual material performance. It was unexpected to find no cracks in the base metal heat affected zone after repair welding Haynes 282 when examining over 100 weld cross sections. 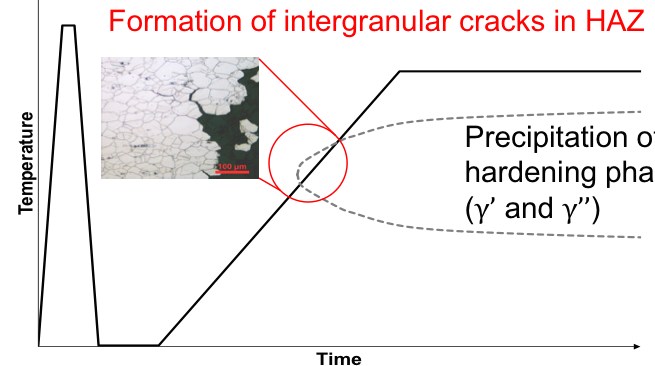 General mechanism of strain age cracking. Fast heating and cooling during the weld thermal cycle, followed by slow heating to post weld heat treatment, where stress relaxation coincides with precipitation of hardening phases and intergranular cracking occurs. Deformation behaviour of Haynes 282 tested at different temperatures. More brittle behaviour indicates temperature range with higher risk for strain age cracking.